When conducting field-based research or fieldwork, researchers often operate within complex and dynamic social and political contexts, and derive their data from that environment. Both the quality of research and the security of the researcher are a function of how well-planned the research is, taking into account the local context and the risk environment. 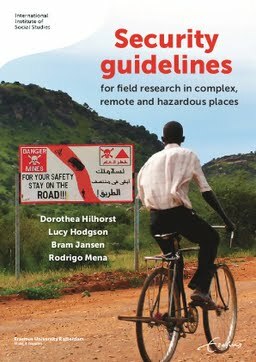 This manual is designed to assist researchers in conducting their research in hazardous, remote or complex environments as safely and securely as possible, both for those working within their home country, or as foreigners. The focus of this manual is on the individual researcher, yet takes into account that the researchers’ security planning is usually within the organisational procedures and processes of home or host organisations, designed to enhance the security of research staff and programmes. The manual is meant for all researchers engaging in fieldwork. Some specific guidelines may be more appropriate for expatriate researchers (such as visa information), but we emphasize that most of the risks addressed in this manual can also apply to researchers working in their home country, especially those whose home and normal residence is elsewhere, and those who work in a remote or hazardous part of their own country. Considerations of security are obvious for researchers working in conflict environments. However, this manual is meant for researchers operating both in volatile environments and in areas not considered particularly hazardous. Many of the hazards discussed also apply in apparently stable areas, that may, however, however be very violent, or suddenly become so. Situations can deter into instability within a period of days, weeks or months. In addition, seemingly ordinary health and safety concerns may take on extraordinary significance in precarious environments without proper awareness and risk management planning in advance. While researchers maybe well aware of some security threats in their fieldwork environment, it is common for them (or their home institutions, insurance providers, or others) to misjudge or misprioritize those concerns. To err in this regard is human – no one can know all the risks present in all circumstances – but it makes proper preparation and risk management planning all the more critical to the success of a research programme. Researchers reading this manual are thus encouraged to focus on those aspects that are relevant to their own research situation. ‘An ounce of prevention is worth a pound of cure,’ as the saying goes, and this is particularly true when applied to the spectre of dealing with safety and security emergencies in remote and unstable environments. Security incidents and security related decisions can have an influence not just on the security of the researcher and the research outcomes, but also on the security of the respondents, local assistants and interpreters, the home and host organizations, and research sponsors. It is therefore essential that researchers plan their research taking into account the risk environment, and remain security aware throughout. Field research always carries a degree of risk, that may jeopardise security and affect the quality of the research. This places responsibilities on researchers with regard to the methodological and ethical choices they make. This manual was written by three academics with a long track-record of fieldwork in disaster or conflict situations, and a security expert (Lucy Hodgson). The manual was motivated by our experience that researchers tend to largely rely for their security on their cordial relations with research participants. While this is arguably the most important aspect of security, we want to stress that risk management requires more cautious attention. There are many ecurity manuals, but these rarely take account of the special conditions of field-based research. The manual is divided into three sections. The first section deals with the particular security considerations posed by field-based research and suggests a set of ethical guidelines for field-based research. Section two is a field manual and details how to conduct context analysis and risk assessment as well as how to plan and stay healthy during the course of field research. The final section is largely comprised of checklists and key considerations to assist researchers in managing their own personal security, both in terms of preventive and reactive measures. This manual does not replace the need for organisational and individual security planning and training, but can be used to support and guide it. Many sections speak of home and host organisations. Home organisation is the institute where the researcher belongs, whereas the host organisation facilitates the research in the area where it takes place. The host and home organisation could be the same. When these are different institutions, i.e. when the research takes place in another (part of the) country, it has to be clear whose security policies prevail and who has the duty of care for the researcher. One final warning before we start. These guidelines bring together a great many risks, that most researchers will never encounter during their entire time of fieldwork. Chapter 4 provides a three-step method of mapping the risks that are appropriate for the specific setting you will be working in. You may not encounter most of these risks in reality, but it is good to prepare for them nonetheless. While we maintain that preparing for risks is a good thing for all researchers, it is good to remember that fieldwork is often a wonderful, rich and safe experience, that is to be enjoyed!